Are you really curious to know, how many backlinks your site has? In this day and age, it is not a difficult task any more to track the number of outgoing and incoming backlinks of your site. However, most FREE backlink checkers are not up to the standards except Google Webmaster Tool which does provides detailed information about the site’s health and backlinks. In spite of all these features, you cannot compare the perks of a FREE and a paid tool. Keeping that in mind, our team has decided to giveaway three Ahrefs.com PRO accounts to our fellow followers but first let us look at the few bounties they you would get on using Ahrefs Professional account. 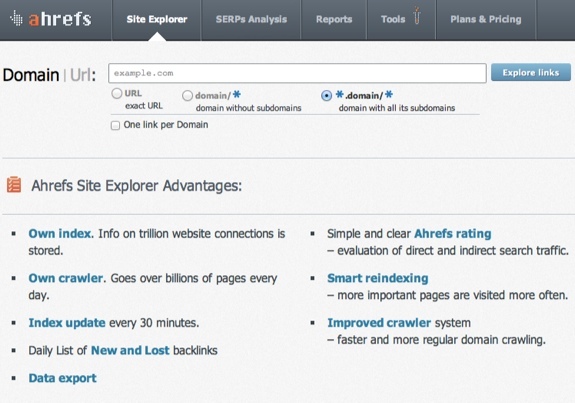 Ahrefs is the newest addition to the link research tool portal. They are using their own algorithm that collections information from billions of websites all around the globe. According to them, they update their index after every 30 minutes and the fresh data is visible to users after the 30 minutes of actual time of update. Following are the few key features of Ahrefs.com. It also works like Majestic's Site Explorer and SeoMoz's Site Explorer. You can choose a certain domain or sub-domain, and it would provide you comprehensive details about it. Take a look at the following screenshot which shows that it also display’s a brief history of last 45 days. On the left side of your screen, you can see some interesting statistics like total number of backlinks referred by unique IPs, domains, etc. It also shows the backlink types whether they are dofollow, site-wide, nofollow, redirected or not site-wide. This tool is a new addition to Ahrefs tool inventory which generates accurate and comprehensive SEO report for a specific domain. Now let me quickly guide you through the features of this excellent tool. Duplicate Title & Description: When are running a website which has almost thousands of articles it gets almost impossible to see through whether they are serving duplicate title tags or Meta descriptions. This tool provides you the flexibility to check which page of your site is serving duplicate title or description. You get information of your all pages in just one go. 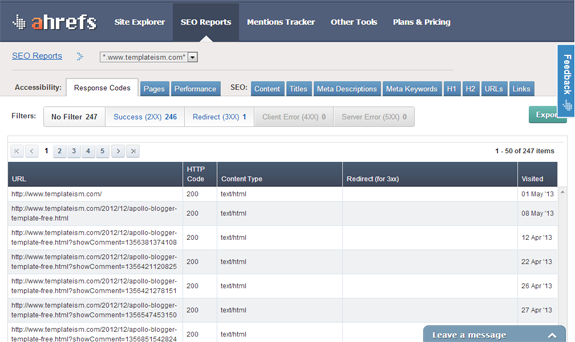 Site Performance: This tool also allows you to track the performance of your different pages. It tells you significant details like speed and the size of the page. With just one click, it provides details of your all pages serving on different URLs. Internal & External Backlinks: If you care about your SERP ranking, it is extremely crucial for you to keep an eye on the number of internal and external backlinks present on different content of your website. 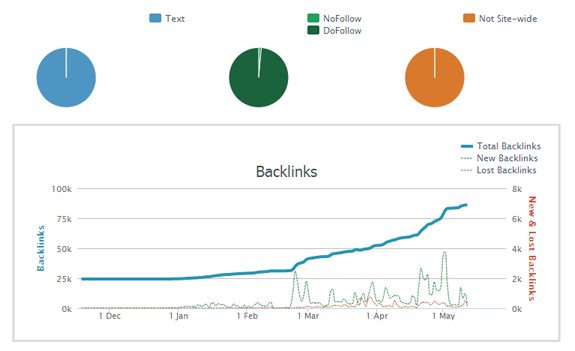 This tool exactly provides you a deep analysis of the backlinks your site is serving. This is a handy tool which allows you to track any mentions that your site or brand is receiving from all different websites across the internet. 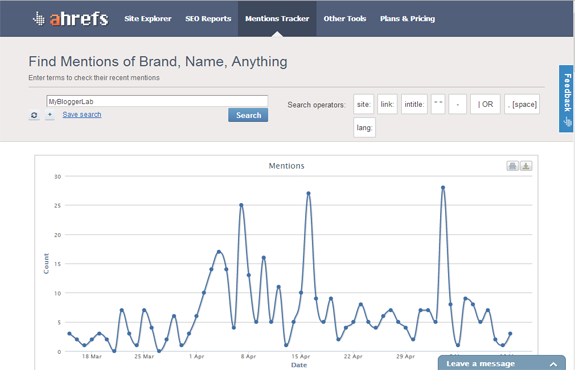 It even shows the brief history of the mentions that you are receiving on the basis of numbers. 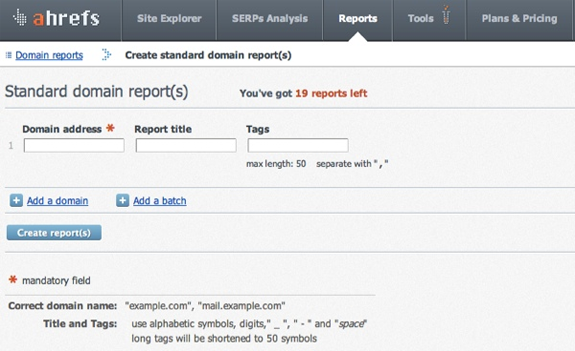 You can create reports for multiple domains as allowed in your subscription. This not only saves your time but also helps you in monitoring your competitors. The coolest thing that it offers it the filter which actually allows you to get the most accurate report for your all domains. We will be choosing 3 winners and each winner will get a one month Professional subscription from Ahrefs.com. The results and names of the winners will be announced on 19, May 2013 (Sunday). For more detail information about Pro subscription check out Ahrefs Plans & Pricing. Note: To be able to participate in the giveaway it is must that you have an ahrefs.com account, so first go and sign up for a FREE account. Sign Up for Ahrefs.com Free Account Now Leave your opinions about this giveaway so that we can bring you more such sorts of freebies. Just follow the Punchtab widget to enter the giveaway. The more entries you will receive, the more chances of winning. Quick Tip: Share Your Referral Link With your Friends and every time Someone joins the contest through your refer you will Earn 5 Points for Each entry. Lets See who wins. Your time starts now!